Setting appropriate directory and file permissions. I know my ethernet cable termination is horrendous, I'm getting it fixed soon. Hopefully by now you'll have some idea how to SSH into your device. SSH into the device or open up a terminal. If you had ran the lsblk command before plugging in the USB device, you'd have only seen entries under "mmcblk1". This shows the boot MicroSD card and its various partitions. Usually a newly plugged in USB drive shows up as sdX with X being a letter. In this case it's sda but it could also be sdb or sdc depending on your configuration. The numbers after the letters demarcate the various partitions present on the device. This shows that our device (the flashdrive) has a capacity of 14.9 GiB (or 15.99 GB). 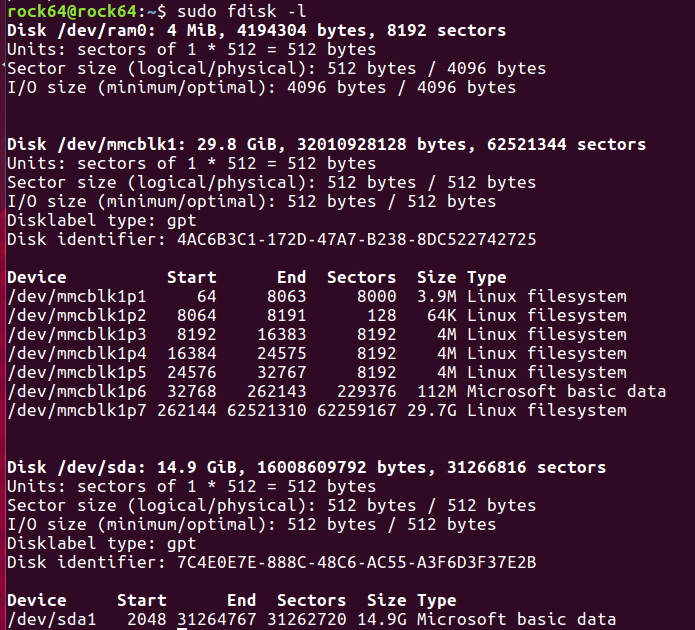 The sector size is 512 bytes long, and it has one partition, "Microsoft basic data" which is know is a FAT partition. You could use the flash drive right now, as is, but using a windows file system on linux is suboptimal. Instead, we will be making a new partition table and a linux partition. Caution: Doing the following will erase all data from the drive. Please make sure you backup any important data on the drive! Type in "m" and press enter to get an extended menu. 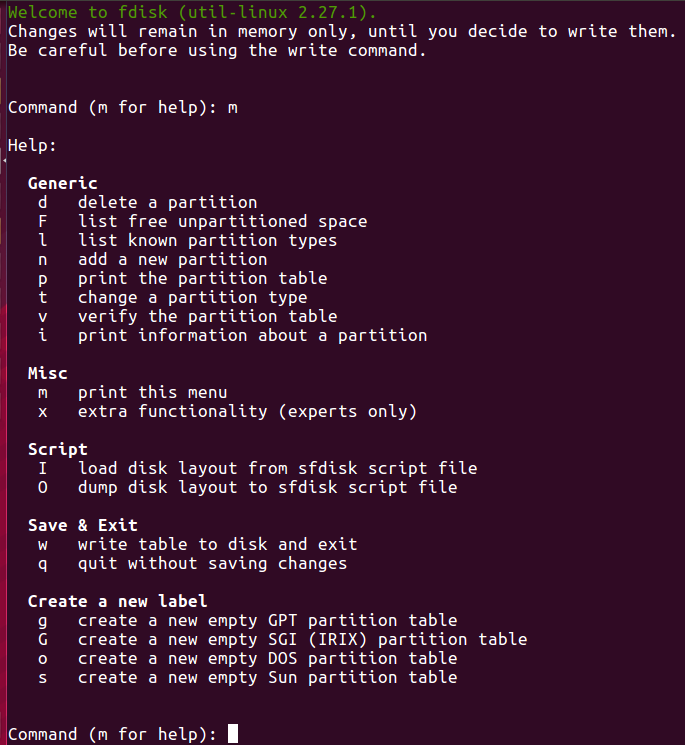 You have the option to create a new partition table. DOS is the most compatible, but larger(equal or greater than 4TB) devices, GPT is used. For a flash drive, either would suffice. In this case, I will go with a GPT Table. So I type in "g" and hit "enter"
Created a new GPT disklabel (GUID: 99E3E866-3783-46DE-9FDA-FE25587DB875). Now we can add a new partition: Press "n"
The tool will then ask you to choose the partition number, I chose the default (1). It then asks you what sector you want the partition to start and end (and how bit it will be by extension). I simply hit "enter' to select the default. 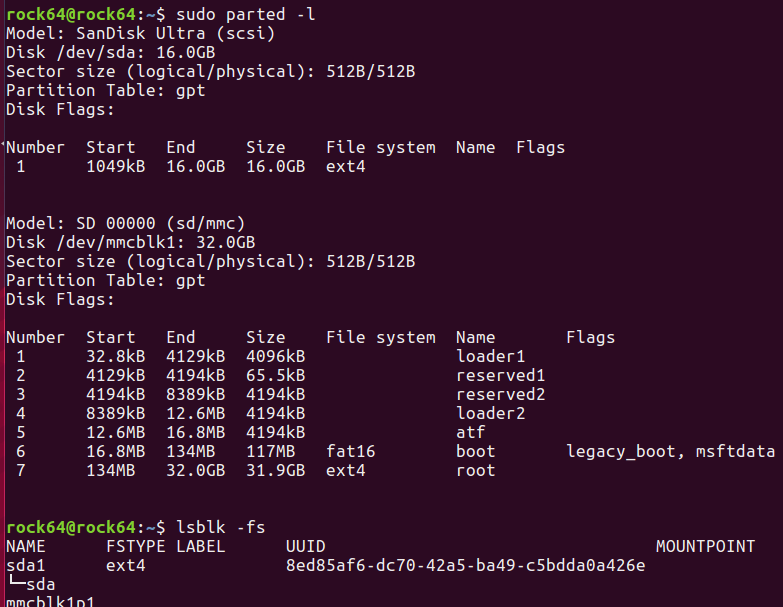 Created a new partition 1 of type 'Linux filesystem' and of size 14.9 GiB. We are almost done making the partition. Type in "w" to write the changes to disk, and hit enter. It will write the changes to disk and exit the tool. You can rescan the device with "sudo fdisk -l /dev/sda" to confirm this. We now have a partition but its empty! We need to format it with a filesystem. I personally have used ext4 for many years without drama, and thats what I will use in this tutorial, but there is really nothing stopping you from using other filesystems like xfs or btrfs. The filesystem tool might warn you about a prior filesystem, press "y" and hit "enter" to ignore the warning and proceed with the formatting. This warning happens sometimes when you don't completely format a drive before adding a new table and partitions. This shows that you now have a ext4 filesystem on the first (and only) partition of the flash drive. In order for the filesystem to be written to and read off, linux needs to "mount" the filesystem. Most Distros mount partitions automatically on boot, so if you reboot your board, you should see your new partition mounted after the next boot. it is mounted here according to its partition UUID. However if you want more granularity, you can mount the filesystem/partition manually. For manually mounting and unmounting, there are two tools that can be used: mount and pmount. pmount is a wrapper for the standard mount program and simplifies mounting and unmounting and allows a normal user to mount and unmount without root privileges. Confirm by typing in "y" followed by the enter key to install pmount. Mounting using pmount is exceptionally easy, you simply invoke the command with the first argument being the partition, and the second one being the mount location. In this case, lets say we want to mount it in a directory in /media/ . .... And thats it! 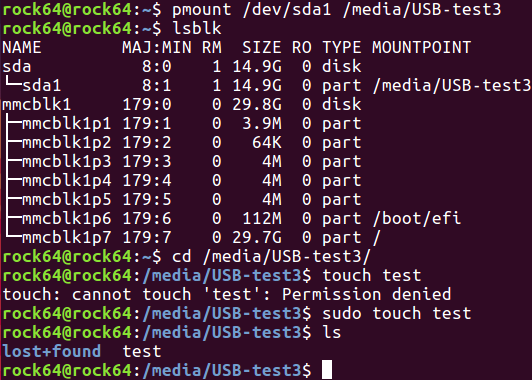 The filesystem on /dev/sda1 has been mounted on /media/USB-test. I didnt have to make a "USB-test" directory or anything, pmount did everything for me. If you want to use the standard "mount" command that comes with almost all linux distributions, you'll need to do some preparation before mounting the partition. Mounting using fstab will be covered in another guide, later on, I will link it back here. Since the mkfs.ext4 ran under superuser privileges, the permissions in the filesystem needs to be modified if you wish to write to it with any user other than root. Mount the ext4 filesystem using any of the means mentioned above. You will see that you will be unable to make a file. However if you try again using the root user, it should work, showing you need to address the permissions. After changing the permissions, you should be able to navigate back into the mounted filesystem and write to files.